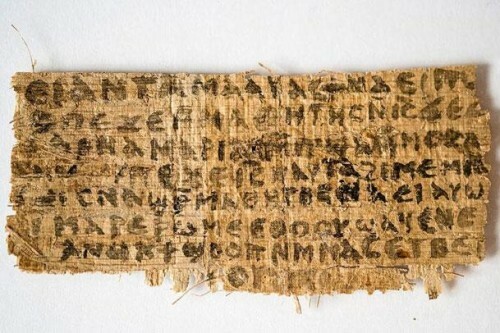 What’s now being called ‘The Gospel of Jesus’ Wife’ is a piece of papyrus with eight statements, written in Coptic and dated to sometime in the fourth century. One of those sayings has gotten the most attention in recent days: “Jesus said to them, ‘My wife…” The other lines are also intriguing. One reads “…she will be able to be my disciple.” Another refers to a Mary; unclear whether it’s Jesus’ mother or Mary Magdalene or another Mary. Jesus does mention his mother in one phrase. And in another he seems to say something about cohabitation: “As for me, I dwell with her in order to…” All in all, it’s an interesting find and it’s got people talking. Here’s what it’s not: it’s not a definitive answer as to whether or not Jesus had a wife. That will go unknown, now and always. (As for me, if there were a Mrs. Jesus, it wouldn’t change the story.) The interesting take-away from this papyrus, for me, is that it shines a light onto early Christianity, and says a lot about how they lived – and we still try to live – with different people, divergent opinions and theological diversity and, yet, at our best stay true the union of which Christ spoke. The community from which this tiny shred of an ancient papyrus emerged had something to say about affirming the place and role of women in the church, at least this one Christian community. Obviously, there was a relatively dominant strand in the early church, most likely a byproduct of its Graeco-Roman environment, that sublimated the place and role of women and exalted that of men’s leadership. The household codes in several New Testament writings (Col. 3:18-4:1; Eph. 5:21-6:9; Titus 2:1-10; 1 Pet. 2:18-3:7) mimic similar codes that would be easily identifiable in the Roman Empire of the first century, placing women subservient to men – just as slaves are to masters, and children to fathers. The New Testament codes, unlike those of secular Roman society, do not give men absolute power, however; but insist on some level of mutuality and responsibility. We know that that dominant strand exercised, in time, almost unilateral prominence as Christianity turned from a movement to the Empire’s organized, institutionalized and, eventually, official religion. One needs only to look at the norm of an all-male priesthood, for instance. But that was not the only strand of Christian thought and practice, certainly not in Christianities earliest days. One doesn’t need a newly uncovered papyrus to know that. That alternative strand is in the pages of the New Testament. Luke’s Acts of the Apostles, for one, is filled with women who are named and lifted up as leaders in the early church – Lydia, a wealthy patron of early Christians, is named (and her husband isn’t!) in Acts 16:14-15; a woman named Priscilla and her husband, Aquilla, were leaders in the early movement and have been traditionally listed among the 70 Disciples (Acts 18:26). In John’s gospel, for instance, the first person Jesus tells of his Messiahship is a Samaritan woman (Jn. 4). And even Paul, whom many think of as the ultimate mysoginistic, patriarchal pig, turns out to be quite egalitarian: affirming that “…there is neither male nor female” (Gal. 3:28); addressing Phoebe as a deacon (Rom. 16:1); writing glowingly to Timothy about his grandmother’s (Lois) and mother’s (Eunice) faith, notably saying nothing about Timothy’s grandfather or father (2 Tim. 1:5). The New Testament is fascinating, to me, because it seems to preserve arguments, encapsulate disagreements, and lift up a varied story of the earliest followers of Jesus. In spite of the attempts of some Christian communities to normalize and regularize this new faith, there was, looking at the whole, a divergent and diverse collection of Jesus-followers, many of whom, if they were ever together, would disagree passionately about a lot of things, including the role of women. To me, this newly uncovered Egyptian papyrus suggests that that conversation or, rather, argument continued. Even centuries after the dominant, male-leadership strand of Christianity became relatively normative, there were still followers of Jesus who said, “We disagree…” And this papyrus, if it’s authentic, is a wonderful witness to that diversity. We make a mistake when we talk about “the early Christian church” or “early Christianity”, as if it was a singular, monolithic entitity. We’d be better to talk about the early Christian churches, or early Christianities. Likewise, we make a mistake when we back up our arguments by claiming, “The Bible says…” The Bible says a lot of different things, and that doesn’t make it less holy or less credible. In fact, it makes it more credible and, indeed, more holy because I can see through its human words and broken understandings and philosophical attempts at comprehension (“…through a mirror dimly,” as Paul said) and see the hand of God, gently and profoundly keeping our focus on the main thing and away from the nagging, divisive details. Christianity, then and now, is a very big tent, for we’ve never done a great job at getting everybody on board doctrinally. Turns out Jesus had something to do with this. Mark’s gospel preserves an interesting snippet in which John approaches Jesus and proudly affirms that they stopped a local healer from using Jesus’ name since “he was not following us.” (Mk. 9:38) Interesting that even in Jesus’ day his very disciples were drawing lines and making determinations about out who was ‘in’ and who was ‘out’, and whether the name of the Galilean wonder-worker was copyright-protected! Jesus’ response, in fact, is what led the early churches – and us – to this wild-eyed diversity. Not only does Jesus tell John to back off, but he goes on to say that that “whoever is not against us is for us.” Organizational theory experts and business consultants would say that that’s a downright terrible organizing principle – assuming, of course, that one’s goal is to make determinations about membership and privilege; assuming, of course, human standards. But Jesus does not assume these things, and Jesus does not create borders and rules. In fact, Jesus reserves his real judgment for those who do put up rules and restrictions and human interpretations. According to Jesus, if my interpretation gets in the way of someone’s faith development, it’d be better if a great millstone was hung around my neck and I was tossed into the sea. Yikes! Jesus was not instituting a new religion. Jesus was not a bishop who sought to organize the people around core beliefs and a Creed. Jesus was not a systematic theologian who took biblical themes and developed doctrine and dogma. Jesus was not a catechist who explained mortal and venial sins, and gave you a list of what you could or couldn’t do. No, Jesus came to renew God’s Body in the world, to renew God’s kingdom within the ordinary, everyday hearts of women and men who had, over time, forgotten that they are special and created in God’s image, and that that is an indelible mark. Emmanuel, God-with-us, became one of us to show us how to live and love and forgive and share, in the hopes that once we learned to do this we, too, would become one with Him, united in those things that matter. And this is a message that matters, as much today as it did in the earliest years of the Jesus Movement. What unites us, one to another, is certainly more profound and more lasting than what divides us, but you’ve probably heard that before. You’ve probably heard it, and suspected that someone had a philosophy or governing principle or organizational theory that they were going to sell you – once they had convinced you of the shallowness of your particularities, once they had convinced you that you really wanted unity … their unity. But what they didn’t convince you of was the depth of your particularities – the ways in which you and I, as wonderfully constituted human creatures with ego and pride and vainglory, hold on deeply to our standing and beliefs and man-made ways. This is what’s called in the church ‘sin’, and it doesn’t go away by a simple sell or desire to wish it to disappear. The divisions we erect are precisely that – our divisons, our made-up stuff – but they are not easily taken apart, not easily removed, not easily broken down and set free. Sin is real and it is really within us, convincing us, day after day, that we are the lords of this world – that our politics is right (and others is wrong and, not only that, but evil); that our economic policy is the best; that our government is the only true one; that our demands are, of necessity, to be met; that our thoughts are brilliant; that our opinions are, by definition, wisdom; that what doesn’t satisfy me is bad, that what does is good, to be sought after and cherished. This is not the way of God, obviously not the way God modeled when he became one of us and walked among us and lived and, yes, died as one of us, dying the horrible death of a common criminal, left hanging on a cross. The way of God is to pour out himself, to pour forth in generous abundance for the salvation and redemption of the world. This is not an easy way – note the cross – nor is this a self-learned way, nor is this inherent to us, we who are indeed pretty darn fallen. Look at the myriad Christian groups, today, all the various denominations and groups, some of whom claim that they, still, are the one, true church and none others are like unto them – and they, alone, are like unto the Kingdom of God. We are still as divided and fractured as the earliest followers of The Way, still as torn apart and diverse and divergent as they were thousands or years ago. And isn’t that, then, a wonderful thing? Look past the ideologues and the sinfulness and pride, of course, and look at the whole picture. Look at the ways in which God is glorified in the fullness and completeness of human experience – liturgical churches, here, and praise and worship, there, and charismatic snake-handlers there, and bible-based preaching, there. Store-front churches and grand cathedrals, hospital bedsides and underground bible studies in lands where Christians are persecuted, still. People who may disagree about particular theologies or doctrines but who are, all together, members of Christ’s Body, serving the Risen One and seeking to give God glory, first and foremost. No, we are not perfect, nor will we ever find the one, perfect church. And in spite of ourselves and zeal for perfection, God is glorified, for whomever is not against us is, we remember, for us. And that’s as true today as it was when a fourth-century scribe scribbled some strange notes about women and Jesus and begged to disagree boldly in faith.